The cranial nerves (CN) are a set of twelve pairs of nerves that are part of the peripheral nervous system. They exit the cranial cavity through foramina or fissures, and are covered by membranous sheaths derived from the protective tissue of the cranial meninges. The cranial nerves are numbered from I to XII, from rostral to caudal, according to their general distribution and function. They innervate the structures present in the head or neck, with the exception of the vagus nerve, which descends through the neck and into the thorax and abdomen to supply the viscera there. All cranial nerves originate from the brain; however, the accessory nerve (CN XI) also has a major spinal component as well. Like the spinal nerves, the cranial nerves are formed of bundles of sensory or motor fibers or a mix of both. Moreover, some cranial nerves have special sensory and motor components too. The special sensory components are related to hearing, vision, olfaction, balance and taste. The special motor components, on the other hand, are those that innervate skeletal muscles derived from the pharyngeal arches rather than somites. Embryologically, each of the six pharyngeal arches is associated with a developing cranial nerve or its branch, except for the fifth pharyngeal arch, which does not develop at all. These cranial nerves innervate the musculature derived from the pharyngeal arch. 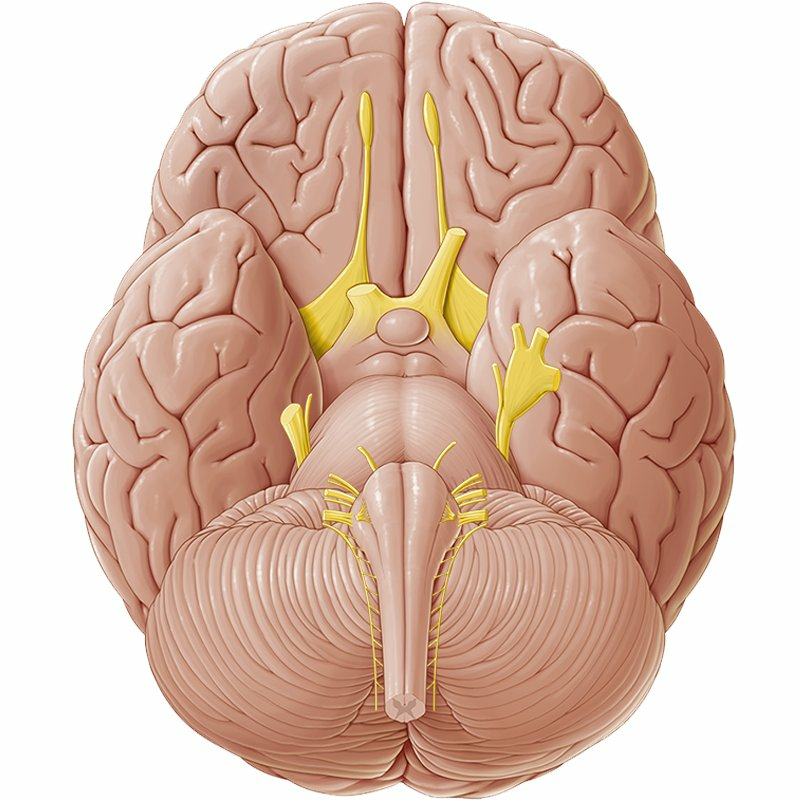 All cranial nerves are connected centrally to the cranial nerve nuclei. The cranial nerve nuclei are a group of neurons (gray matter) from which efferent motor fibers originate, and afferent sensory fibers terminate. They are located in different parts of the brainstem, except for the cranial nerve nuclei of the olfactory (CN I) and optic (CN II) nerves, which are located in the cerebrum. All the cranial nerve nuclei, except that of the trochlear nerve (CN IV) supply nerves of the same side of the body. Lesions occurring in any one of the nuclei resemble the severing of the nerve they’re associated with. The olfactory nerve is the first cranial nerve (CN I). It is purely sensory and is responsible for smell. The optic nerve (CN II) is sensory and responsible for vision. The oculomotor nerve (CNIII) is motor. It innervates four out of six of the extraocular muscles and is responsible for eye movement. The trochlear nerve (CN IV) is motor and innervates the remaining extraocular muscles. The trigeminal nerve (CN V) contains both motor and sensory fibers. It subdivides into three branches, the ophthalmic (V1), maxillary (V2) and mandibular (V3) nerves. Those give sensation for the face and innervate the muscles of mastication. The abducens is the sixth cranial nerve (CN VI). It is motor and is associated with eye movement. The facial nerve (CN VII) is both sensory and motor. It is mainly involved in facial expression, but also has special branches that serve other functions. These branches are the: nerve to stapedius, chorda tympani and lacrimal nerves. The vestibulocochlear nerve (CN VIII) is sensory and is associated with hearing, and balance. The glossopharyngeal nerve (CN IX) is both sensory and motor. It provides taste for the posterior one-third of the tongue and sensation to the pharynx, in addition to innervation for the stylopharyngeus muscle. The vagus nerve (CN X) is both sensory and motor as well. It provides parasympathetic innervation for various structures throughout the body. The accessory nerve (CN XI) is motor. Its cranial component joins the vagus nerve, while its spinal component innervates the trapezius and sternocleidomastoid muscles. The final and twelfth cranial nerve is the hypoglossal nerve (CN XII). It innervates the extrinsic and intrinsic muscles of the tongue, except for the palatoglossus. Want to learn more about the Cranial nerves?